On Line-Up Changes And Finally Making It To Oz Thanks To MewstraliaJonas Bjerre is a pretty knowledgeable guy — despite chatting in a language not his own. But even he was unaware that Australia has recently displayed a great appetite for all things Danish. Do the moderators of this site know if Bo Madsen is permanently gone? Evidently they knew how long Mads Wegner had to rehearse to replace him so it is reasonable to assume that they know more details about this situation, as they have direct contact with Mew. On my behalf, I can say that I have no information. I don’t think that even Mew know if it’s permanent or just a long break. It seems to be very much up to Bo. Mew is having big plans for future, so rest assured, that the band is not going anywhere anytime soon. Here’s for the next 20 years! Thanks, Tero. Sorry for the bluntness of my question. Is this official? Or simply the interpretation of the interviewer. Out with the old, in with the mew- Chinadaily.com.cnIt's no stretch to say that, when it comes to China's indie music scene right now, quirky is definitely in. So Danish alternative rock outfit Mew should feel right at home when they make their debut in China this month. Seeing the new promo shot, is it possible that Nick Watts and Mads Wegner are officially becoming members of Mew? What do you guys think/know? I think it might make more sense for them to work as a five-piece than a trio without a guitarist. But they’ve always seemed to not be in favour of making other people official members. So who knows? I have no issue with Watts becoming a member. He’s been with the band for yonks and he finally has a writing credit! …any news from the inner circle concerning Bo? Amazing. Wish I had been there. I actually started crying watching this, wow. I’m super curious about the visuals, can’t really see them. The visuals were some kind of a choir of monkey like creatures who appeared to sing during the last part of the song! Also there were new visuals during a couple of other songs! I remember a song which included video of red Johan Wohlert sailing a boat or something (if I remember correctly) ! Cant remember which song thou! It seems almost like a “f**k you” to the rest of Mew that Bo could play here, but not with them. All I got is that there is a wolf which is mentioned to have been “set up” at the end of track three, but in the middle eight of track seven it is related that wolves have passed away, although the narrator doesn’t inform us of the cause of death. Guess their circuitry wasn’t good enough. I love that we’re hearing a lot more of Johan singing. He’s got a good voice. He was co-lead singer of a band quite often for about 6 years, no? Very nearly 10 years ago… Wow. 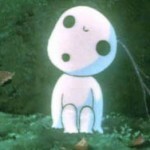 One of the best things from Princess Mononoke! Sad that I cannot really get to like that movie as much I want! Check out Mewsite, new album announced, first single Satellites is up.